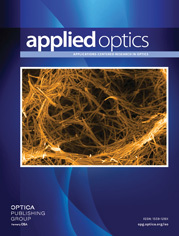 The authors are with the Department of Electrical and Computer Engineering, University of Alabama at Huntsville, Huntsville, Alabama 35899. The mutual coherence function (MCF) of strong-fluctuation theory as a result of optical energy passing through a transversely and longitudinally inhomogeneous aero-optic turbulent layer is studied. Solutions for the MCF equation are determined by decomposing the MCF solution into coherent and incoherent parts and by solving separately the equations that result from this decomposition. The MCF equations for an arbitrary three-dimensional inhomogeneous layer are presented. A simplified version of these equations for the case in which the turbulence inhomogeneity is longitudinally inhomogeneous and is transversely inhomogeneous in one dimension is also presented. A numerical method for solving the parabolic MCF equations by the Lax–Wendroff explicit finite-difference algorithm is given, and numerical examples of the MCF solution for three different inhomogeneous aero-optic layers are discussed. Equations to relate the point-spread function, the optical transfer function, and image formation to the MCF of an inhomogeneous aero-optic turbulence layer are derived. An approximate MCF Fourier integral solution is presented and compared with the exact finite-difference solution. A formula to estimate the validity of the approximate integral solution is given.